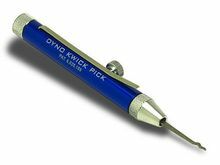 The Dyno Kwick Lock Pick Tool is about the size of a marker pen and fits into your pocket or purse to be used to open a wide variety of locks including briefcases, padlocks, many automobiles, pin tumbler locks, doorknob locks, wafer locks, file cabinets and more. To become proficient may take some practice. I started with file cabinet locks and got some confidence and went from there. Set includes the Dyno Pick Handle which serves as storage and a handle for the pick. The housing also has a convenient pocket clip. The pick itself which retracts into the housing and instructions.